Hot days are here and that means your air conditioner is working on overload. Keeping your home cool during the summer is important to you and your family. You may want to ask yourself if your air conditioner is working efficiently and if you are doing all you can to ensure that your home is saving on energy costs. Below are 10 ways you can improve your HVAC. Turn off the unit before beginning any maintenance. You will find this near the unit, turn it to the off position. Using a hose spray the outside of the unit to clear any debris off. Using a coil cleaner, recommended by your air conditioner’s manufacturer, spray the unit and wait for 15 mins for the cleaner to foam. Spray off and repeat this every year. 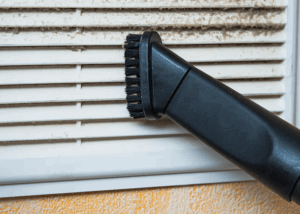 Indoor vents can get covered in dirt and grime. 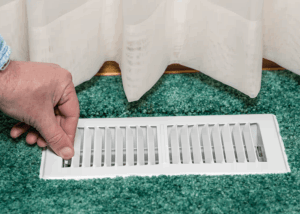 Taking a vacuum and going over the vents will help air flow move better into the home. Just like upgrading your thermostat to help save on your energy costs, you should consider upgrading your unit. If you have an older unit it may be leaking and using more energy to cool your home during the summer. Upgrading to a newer efficient air conditioner unit will save you money and make your home more efficient. Adjusting your thermostat a few degrees up in the summer will help you save on your energy. If you have a programmable thermostat adjusting the temperature in your home for when you are not home will lower your costs. 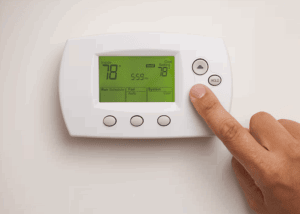 Consider upgrading to a programmable thermostat in your home, so your home is nice and cool when you arrive back home. Insulating any ductwork as well as sealing off any leaks your ductwork may have. Another area to check is your home are the rim joists. Insulate and seal off any leaks and it will save you money in energy costs. Install curtains and blinds on your windows and keep them closed during the day to keep out some of the heat of the sun. If your windows are older they might need replacing with newer efficient windows that will keep the outside air out. Another option is to install storm windows. If new windows are out of the cards for you seal your windows with caulk around the edges to seal off any cracks that might allow air to flow. Removing any debris away from the vent that would be blocking the air, curtains, toys, furniture, and more. Inspect your air conditioners filter to see if any debris is causing airflow blockage. Check your manufacturer’s instructions to see when you should be replacing the air filter. Use appliances such as your washer and dryer, dishwasher, oven later on in the day when it cooler. This will help to keep your home cool and your air conditioner not to run constantly. Your cool air will escape through cracks and gaps found in your crawl space. Encapsulating and sealing off any air leaks to the outside. Keeping this space clean and clear of any water will not only save you on energy costs but improve the air quality in your home. This is another area where your nice cool air can leak out through gaps and cracks and hot air will get in. Sealing these up will help to improve the efficiency of your air conditioner. Also, proper ventilation of the attic will decrease the temperature of the home. Installing a simple box fan will help to decrease the hot air in the attic. If you need more assistance in improving your HVAC efficiency, it is best to contact a professional.